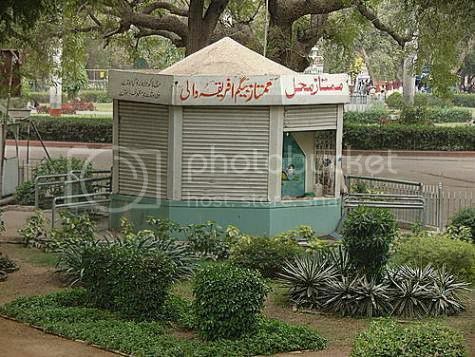 Some of the public parks in Pakistan are one of their kind. Few months ago we had introduced the Haunted House of Hill Park, and today we will introduce Mumtaz Mahal located inside the Karachi Zoo. 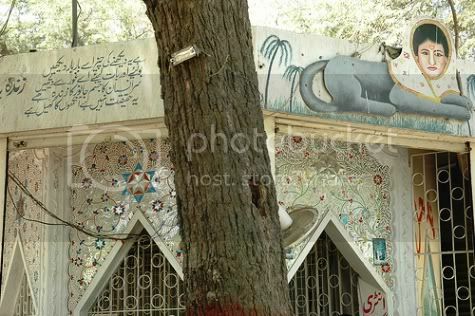 Karachi’s zoological gardens (also called Gandhi Gardens) has many animals to boast about. Animals are however not the only creatures at display here. 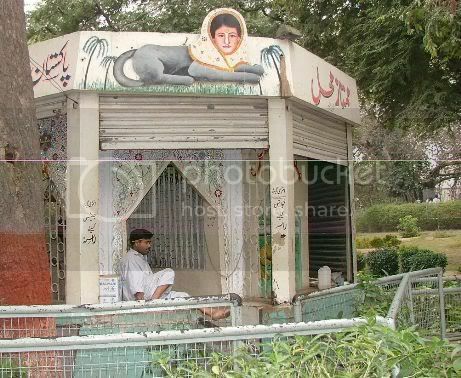 For the past 35 years a ‘maa-fauq-ul-fitrat’ (super natural) character is also kept in captivity here. This creature has a head of a lady and body of a fox. It is kept in a special pavilion called Mumtaz Mahal. Inside the zoo, it is easy to find Mumtaz Mahal as the organisers use megaphone to invite you to see it. Zoo’s entrance ticket does not cover the visit to Mumtaz Mehal therefore one has to buy a separate ticket to see it. This woman-fox creature also tells visitors their destiny and can allegedly answer your questions in any language of the world. I’ll leave the proof of this claim to our readership, who should visit Mumtaz mahal and ask this creature a question themselves. I’ve read on a website that people ask this creature all kinds of questions about their destiny. Somebody even asked about when will he get a work visa for Dubai. The reality of Mumtaz Mehal is of course a big joke or hoax. The lady face is actually an enunch who has been doing this job for many years. The effect of fox body is created by optical illusion using mirrors. One thing I do want to mention is eventhough I wrote off Mumtaz Mehal as a big joke, it is still very popular among visitors. I also have many fond memories of going to the zoo for day field trips with my primary school classes and family. I must admit, at younger age I used to be scared to go to Mumtaz mahal and look at this creature. I’ll now end this post with a very short history note. Actual Mumtaz Mahal was the nickname of Arjumand Bano Begum (1593-1631) who was the wife of Mughal emperor Shah Jehan and in whose loving memory Taj Mahal was built. While doing a web search today I found this interesting video where “Mumtaz Begum Africa wali” is being interviewed by some TV Channel. Reference: ‘Foxy Lady’ is the title of a famous psychedelic rock song by Jimi Hendrix which came out in 1967.
check out the youtube of Mumtaz Begum Africa wali’s interview towards the end of the post. The last photo of this article is added today. Take a look. From the above comments we’ve learned that this Mumtaz begum has been in this foxy ‘roop’ for almost 40+ years now. I am sure it is not the same person for 40 years. Naseer above said that he saw this stunt in 1960s and Jasmine confirmed it for 2007. This must be the longest running show at the Karachi Zoo. 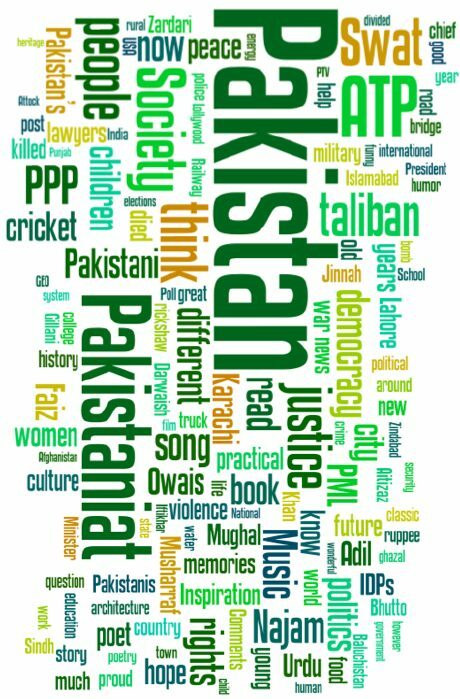 Who is Urooj Mumtaz Khan? Discrepancy: So What Is It?